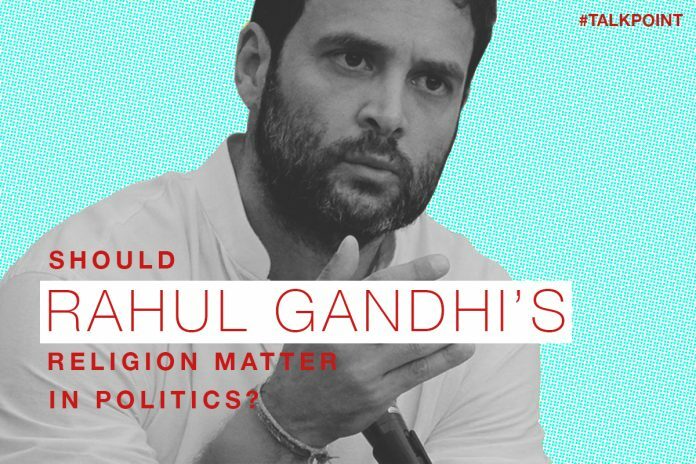 Should Rahul Gandhi’s religion matter in politics? All of a sudden, Rahul Gandhi’s religion is being made into an electoral issue. True, his mother is a Christian, his father was a Hindu, and his grandfather was Parsi. That truly makes Rahul a cosmo-religious man. To raise that as an issue in the emerging campaign shows that the BJP is losing its development plank and is re-polarising the electorate. Mahatma Gandhi used to say that he was a “proud Hindu”. His faith in spirituality was absolute. He often took decisions and actions based on his ‘inner voice’ and ‘divine’ directives. Yet Gandhi was killed by another ‘proud Hindu’ and that too because Nathuram Godse and his mentor V. D. Savarkar said he appeased Muslims, let Partition take place, and even sympathised with Pakistan. The holocaust of Partition was religious in every respect and the entire Hindu Sangh Parivar used to say from the housetops that the villains for that tragedy were Gandhiji, Nehru, and the Congress party. Jana Sangh as a political party was launched by the RSS in 1951, and it campaigned with viciousness at its command against Panditji. Of course, Gandhiji was already dead. There is enough historical data to prove that these religion-based forces may win a few elections, but they can come to power only with the help of regional, ethnic or non-Hindu parties. The first ever elections in 1952 (simultaneous assembly and Lok Sabha), brought Congress to power with stunning majorities. There were no opinion polls, no TV media, no social media, and the newspapers were not too favourable to Congress and Nehru. The press in those days did not expect the Congress to get a landslide majority. Indeed, the Jana Sangh with its so-called religious appeal was expected to perform well. There were also the Hindu Mahasabha, Ram Rajya Parishad, and the Muslim League in the fray. But even on the backdrop of Partition, the voters were not persuaded by religion. They voted Congress, which was openly advocating a secular republic. There were critics and the elite was divided. Congress had Muslim candidates and yet the Hindus as well as Muslims, scheduled castes and tribes voted Congress in huge numbers. Hindu-majority areas elected Muslim candidates and Hindu candidates won in predominantly Muslim areas. The same pattern repeated in 1957 and even 1962. There was a slight increase in the vote share of the Jana Sangh. The Right wing Swatantra also made its mark, just as the Communists and the Socialists did. But the overall vote was overwhelmingly for the ‘non-religious’ parties. Most Jana Sangh and Hindu Mahasabha candidates lost their deposit. There was no traction for them even in urban, upper caste, and prosperous constituencies. In 1967, the Jana Sangh improved its tally, just as the Communists and Swatantra did. But except the Jana Sangh, no other party made religious appeal to the voters. In 1971, Indira Gandhi swept the poll on a ‘secular’ slogan of “Garibi Hatao”. The RSS and its political front Jana Sangh were so frustrated that they lost all hope of coming to power on the Hindu card. The Emergency provided for all opposition parties a huge bonanza. Jana Sangh merged itself in the Janata Party, blessed by no less than Jaiprakash Narayan, as a nationalist mainstream political organisation. But that was a short-lived affair. The non-Hindutva parties within the Janata confronted the Jana Sangh and demanded that they give up RSS loyalty, that is, religion-based politics. The Janata Party was split on this question of Hindutva. The newly formed BJP now concluded that religion does not get them votes. So, they claimed that they will follow the ideology of Gandhian socialism. But the BJP was routed in 1980, bringing Indira Gandhi back to power rejecting even the camouflaged religious appeal. In 1984, the BJP suffered such a humiliating defeat that they had just two members in Lok Sabha. Even Atal Behari Vajpayee was defeated against Madhavrao Scindia. Then the party changed its strategy, giving up Gandhian socialism, they embraced strident Hindutva politics. Though they supported V. P. Singh in 1989, it was only to get some space vacated by Congress. By launching the Rath Yatra as a challenge to Mandal commission politics, Advani and Co. realised that the Hindutva consciousness could be tapped. Since then, the creed of religion in politics has got entrenched. Yet Tamil Nadu, West Bengal, Kerala, Odisha, even Andhra and Punjab, have not let Hindutva forces win. In India, religion and politics can be mixed only by the BJP, not as much by Muslim League because of their 16 per cent population base. However, neither Bihar nor Jammu and Kashmir have been influenced by the Hindutva appeal. Transient victories by the BJP may prompt their supporters to make a huge noise, and the RSS may pretend that Hindutva is now rooted in India. But the dialectic of politics shows that the Hindus have checkmated the BJP, and the Muslims and have rejected radical Islam. But in the current overheated political atmosphere, it is difficult to convince the Bhagwat-Modi-Shah clan that the BJP may have won but politics of Hindutva has no future. Kumar Ketkar is a senior journalist and economist. Reply on sick mentally people need not to be given. I need not to write on my head as Hindu and walk on the way to prove myself Hindu. Why there is discussion on Hindu Muslim in all the fields, be it in TV, news paper, normal public area and why these things happen when BJP comes to power be it in state or in centre. I feel ashamed that we are living with people with such mentality. God save our beautiful, multi culture, multi religion country. Can you please explain how on earth Rajiv Gandhi became Hindu ? Did he inherit his mother’s religion ? Is there any proof that he followed/practiceed Hinduism? OR ATLEAST any occasion he publicly stated that he is inherited his mother’s religion ? Shame on you to involve Savarkar in Gandhi’s murder . Nathuram was a murderer and should always be condemned but how can you name Savarkar in the same breath as that of Nathuram. Did you forget what all did he(Savarkar) went thru for the freedom struggle ? Did he inherit his mother’s religion ? Is there any proof that he followed/practices Hinduism? OR ATLEAST any occasion he publicly stataed that he is inheriting his monthers religion ?